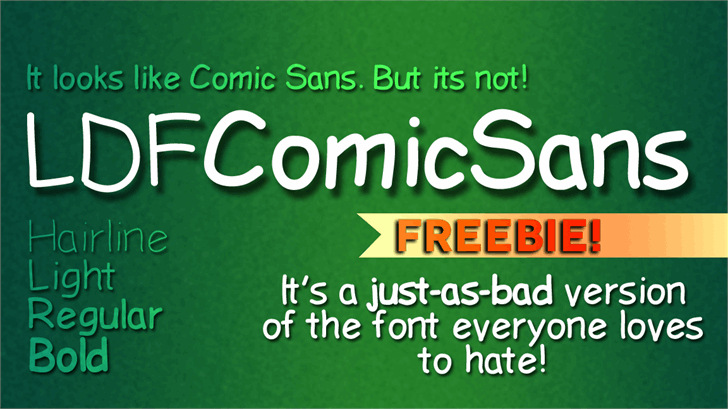 A free alternative to the most hated font on the face of the earth. Feel free to use it commercially, not that you'd want to. This is actually an improvement on Comic sans. What killed the original's ability to look like handwriting was its computerised metrics. But this mutated version kills the metrics, making it a better handwriting font. Perhaps not the most convincing, but it's still better. @Nate547 Thanks, I didn't include C, I, J, r and s. I also made the t differently. Commercial use is an added bonus!! Nate: many (would-be) handwriting-look fonts suffer from the problem that you cited, but some of these are popular in spite of it, and most are, at least, not so universally despised that it's actually become a running gag, as with Comic Sans. I'm not sure convincingness (convincingocity? convincingitude?) is always the first thing everybody looks for in hand-style fonts, although it is certainly important. @viperrific First of all, Comic Sans is hated 1. because of its over-usage in inappropriate situations (which is because of the user, not the font) and 2. Because of (like you said) the metrics and bad kerning of the font. That takes out the human element of the font. Also, people have a tendency to join these crusades of hatred to a subject (Justin Bieber for example) because we feel the need to conform. Basically, we love to hate things. Honestly, I don't hate Comic Sans, I just made this font to see if I'd be able to replicate and improve it by adding 2 new weights. (I guess I'm dating myself here. I hope that a certain bloke from a certain online dating site whom I'd convinced that I was 24 isn't reading this. What sort of inappropriate situations is Comic Sans used in? I don't think I'd noticed that part. 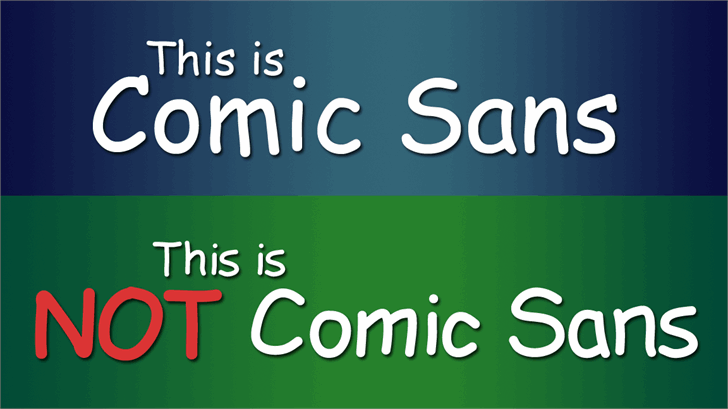 I considered Comic Sans is the least favorite font because of poor kerning and very ugly done metrics.